When public schools are viewed merely as locations for the delivery of educational services, the closing of any particular school is seen as having an impact only on its students and staff. This one-dimensional perspective ignores a larger communal context and significantly understates the effect of a school closing, even a school that is seen as failing its students. Chicago Public Schools (CPS) uses aggressive school closings as a core element in their struggle to manage the challenges many urban school districts face: a shrinking school-age population, weak performance as measured by standardized testing, competition from publicly funded but privately managed charter schools, and inadequate funding. Three years ago, CPS shuttered 43 schools, allowing us time to see the results of school closure. Poorer communities are prime targets for school closures when a school district decides to redistrict because community engagement and organized political power play a significant role when elected officials decide which schools to close. Without a strong financial base, communities have difficulty wielding much political influence, and other demands on their time and resources can be obstacles to meaningful advocacy. The state takeover of the public schools and city budget despite protest from residents illustrates this lack of local political power. Chicago’s pattern did not break this mold. Once the decision has been made to close a school, the school district’s resources turn to the former students of the closed schools and the core task of educating children. 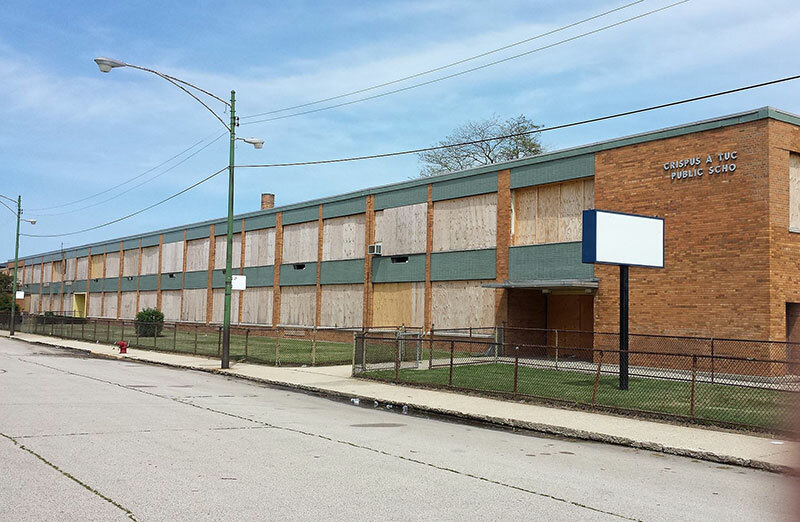 The communities, left with vacant school buildings and the loss of a community anchor, are left alone to cope as they can, making a bad situation worse. Faced with widespread criticism that his administration wasn’t listening to the concerns of residents and parents about the long-term impact of the closures, Mayor Rahm Emanuel created an advisory committee on repurposing. Among the recommendations in the committee’s 2014 report: Set aside some of the money from sales of buildings to help with repurposing of schools in more challenging real estate markets. The fund would have provided initial capital to some buyers. However, the report hasn’t spurred much action. Jim Capraro, a committee member and former longtime head of the Greater Southwest Development Corporation, said that the group’s recommendations have not been implemented the way the committee envisioned. A “repurposing fund” designed to help support quick conversion of closed schools for other community beneficial purposes has not been created. Community groups trying to support the repurposing of vacant schools have been on their own seeking the necessary finances. Professor Anderson describes the impact on already struggling communities left with vacant buildings. [First, they] prevent the land from being used in a productive manner. In lieu of a tax-generating vehicle, there exists an unused building. […] Second, the vacant properties attract violence, crime, and illegal activity. Not only do these undesirable elements have negative effects for the residents in the community, but they also drive away potential investors and reduce surrounding property values. Third, the buildings’ dilapidated nature jeopardizes the health of the surrounding community, by posing health risks including increased danger of fires. Finally, the school district must invest resources in maintaining and securing these schools. Movies are the archetypal windows to the American soul, and the hope was that the new venture would be a beacon of hope and a draw for more commercial development money, the two key pillars of any city’s renaissance.